I’ve pretty much ignored the “found footage” genre for the last year or so. My skepticism is largely fueled by its rather gimmicky nature. Even the best ones are one trick ponies with little to no repeat value. What little novelty factor the genre has left is fast being squandered by unimaginative filmmakers who seem content on using it for a series of cinematic smash-and-grabs. By the time audiences realize what they've been sold, the box office receipts have been tallied and production costs have been recouped. From there it's on to the next one. 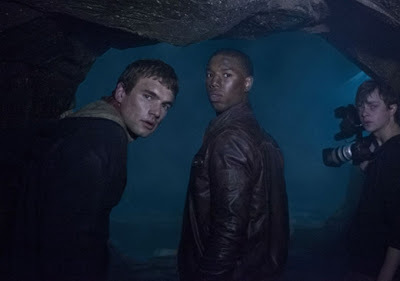 My skepticism aside, Chronicle peaks my interest. The story revolves around three teenaged friends who are endowed with strange powers after investigating a crater. They initially use these new found abilities to indulge in some youthful mischief, but their antics soon give way to truly destructive behavior as their ids begin to fully manifest. To my knowledge, the “found footage” approach has never been applied to superhero films. The very idea brings lots of tantalizing possibilities to mind. The films trailer played like a mash-up of Akira and Heroes. It also seemed to stress a slight horror angle to the material. That is not unexpected, as the “found footage” genre is mostly associated with horror of some sort. A series of clips have recently been released, many of which show the characters exploring their powers in various ways. The latest one shows the trio of friends stumbling upon a mysterious crater in the woods. As is required by such stories, they decide to investigate the crater a bit too thoroughly, leading to unexpected consequences. When the trio finally discovers what lies at the end of dark cavern, a few multicolored images strobe in rapid succession. The clip ends without spoiling the outcome. I really hope that Chronicle manages to live up to the promise of its marketing and advertising materials. With every passing day, the proposed live action adaptation of Akira seems that much less likely to ever emerge from the depths of development hell. The third season of Misfits was hugely disappointing. Chronicle seemingly offers another opportunity for this subject matter to be done right. Let’s hope that its makers have something more to offer than shaky camera work.